Getting kids to eat vegetables can be tough. These carrot recipes for kids are an easy way to get kids interested in trying the orange veggie. You’ll find kid friendly recipes ranging from cake to cookies to honey roasted. When baby led weaning, both of my boys immediately loved 3 things – bananas, sweet potatoes, and baby carrots. It was a relief – simple things that were cheap, easy to prepare, and packed with vitamins! Annnd both times they decided that 2 of those were no longer acceptable. Yes, a year in both boys vetoed carrots and sweet potatoes. And just about every other vegetable I offered in favor of cheese and carbs. I mean, I can’t really blame them. But it’s definitely frustrating when you’re a momma just trying to get your kids to eat a solid meal. Thankfully, with some perseverance, both boys bounced back from their aversions. Do they readily beg for vegetables? No. Do they eat every single thing I put in front of them? HECK no. 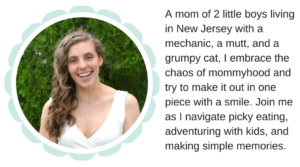 But like I’ve written about time and time again, you cannot give up on the pickiest of eaters. Only consistent, friendly exposure will help your kids feel more comfortable and confident when it comes to trying new things. Part of my “secret” to get kids to try vegetables is putting them into super kid friendly recipes. Maybe it means hiding them in some kind of baked good, seasoning them with a favorite flavor, or adding a bit of sweetness. Whatever your kids are into, it is always a good idea to add the familiar with something unloved. When struggling with where to start with a stubbron kiddo, I always recommend a sweeter vegetable like carrots. Carrots, sweet potatoes, snow peas – they’re all generally kid friendly vegetables. Carrot recipes for kids can be a great way to get picky eaters to eat vegetables! New to carrots yourself? Here’s how to choose the best carrots for you family. Choose bright, deeply colored vegetables. The more deep and bright the orange, the fresher and sweeter the carrot will be. If buying with the tops on, make sure the leaves aren’t wilted – those will be the least fresh. Avoid choosing anything dry or cracked. This can mean they are older and beginning to dry out. Look for firm veggie. Soft or flexible areas on a carrot means it’s getting old. If you’re searching for a version little will like, baby carrots will usually go over better than large ones. Same goes for colorful varieties. Looking to get your kids started eating the orange veg? I’ve compiled a ton of kid friendly carrot recipes. I’m sure you’ll be able to find at least one recipe here your kids will be open to trying! Scones Slightly sweet and fun for kids to help make, these are a fun choice. Honey Balsamic Roasted. If you think your kids will be put off by the vinegar, you might want to skip these. But they will be perfectly tart and sweet. Ranch Baby Carrots. Ranch is such a solid flavor for kids – you can’t go wrong here. Carrot Veggie Bars. this carrot recipe not only uses carrots, but the final product LOOKS like a carrot! so fun. Cookie Sandwiches. Basically better for you whoopie pies! 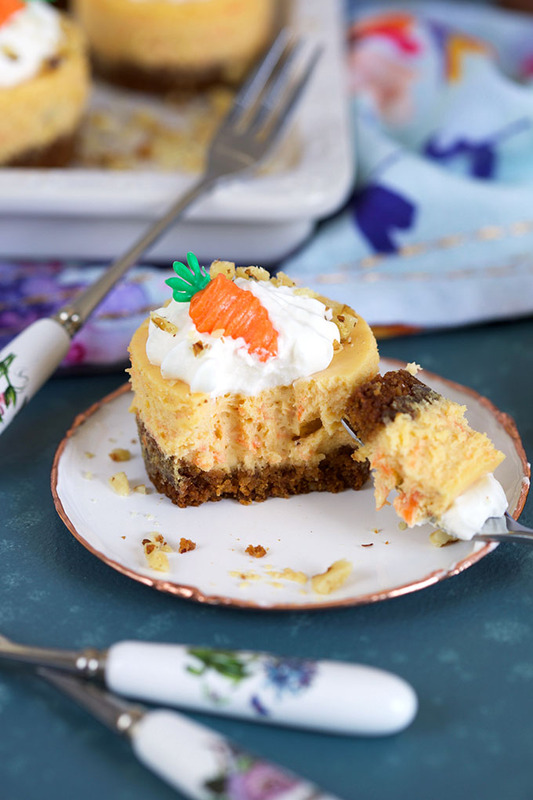 Sneaking carrots into dessert is an easy way to get kids to eat them. 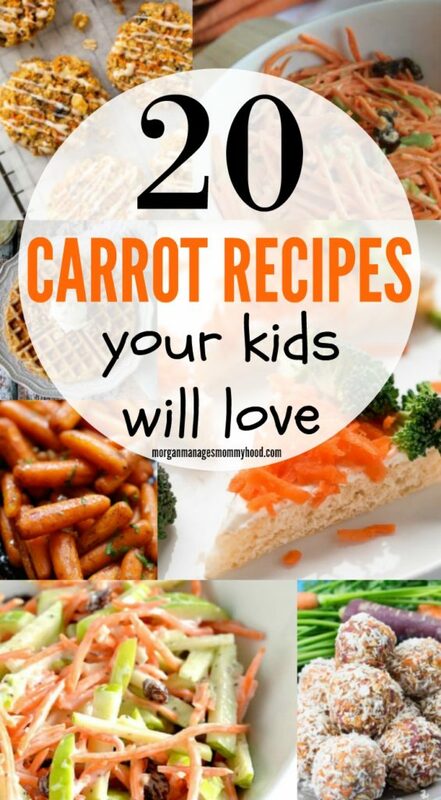 Try one of these sweet carrot recipes for kids! Mini Cheesecakes. These are seriously the cutest ever. I mean, mini everything is basically the best, right? Waffles with Cream Cheese Butter. Carrots for breakfast? yes! Carrot Raisin Salad If you have a raisin lover like I do, they’ll love this. Roasted Carrot Strips. These would be a fun substitute for chips alongside sandwiches. Orange Glazed Roasted. The orange creates a sticky sweet glaze on these. 4 Ingredient Crackers. Skip the chips and make these. My kids loved them when we made this together. 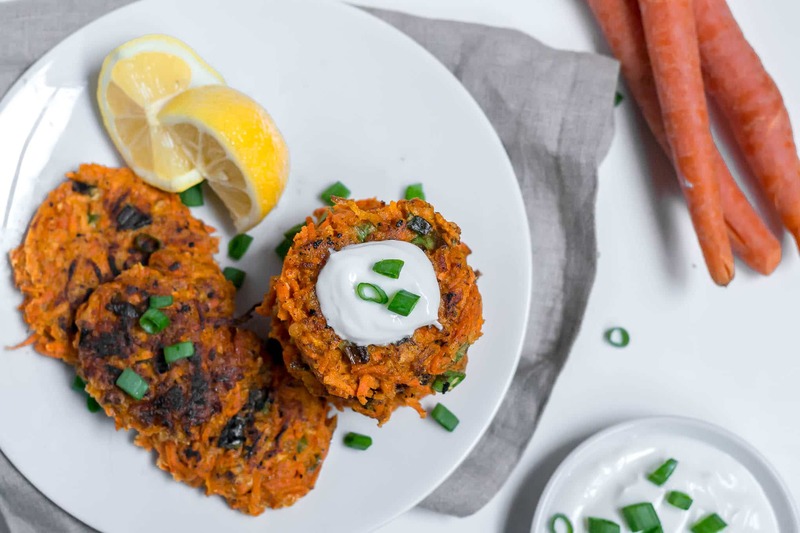 Try transforming the shape when making carrot recipes for kids – a carrot fritter is less stressful for kids than a whole carrot! Fritters. My kids would devour these little fried orange fritters. Carrot Muffins. My boys will eat literally anything in muffin form – these would be such a hit! Carrot Apple Slaw. Sweetness comes from apples in this fun kid-friendly recipe! Veggie Puffs. These look so simple to make and would make a fun snack. Zucchini Muffins. Seriously, put veggies in muffins. Kid love them and they add much needed moisture! Mango Raspberry Popsicles Cool down on a hot day with these simple popsicles. Sugar Cookies. Sugar cookies? Yes. Adding carrots? SO smart! No Bake Energy Bites My boys love energy balls. I love that this one uses multi colored carrots to make these. Oat Cakes These would be so easy to make with your kids! Carrot Cookies – The orange icing on these looks absolutely amazing! Okay, so tell me – what vegetable do your kids cringe at? Which do they love? Let me know in the comments! Looking for more veggie recipes? These spinach recipes for kids are perfect!